You have probably received some of the seasonal return address labels from (insert charity here) looking for various donations this time of year. Be it St. Judes (i do give to this one) or Ducks Unlimited (yep they got me as well - Hey I have hunting dogs that like a duck dinner every now and then, but only if they get it themselves). Have any of you had stamps made? I was using some for awhile that I had done at shutterfly. Needed to use up some free money there and "thought" I would have gone through them before moving. That didn't work out. But now that we are home owners and will DIE in this house. I figured I needed something more permanent to go with the house. So I ordered one from 2impress, they are on Etsy. I prefer Etsy to many others as they cater to vintage and handmade goods. Feels good to support the small businesses. I have been looking for various stamp makers online and just kind of liked their run of stuff.. I do believe I will be ordering a few more of these in different flavors. The pricing was right and the product received is very high quality. So how do you folks tag the return. Handwrite? Stamp? Sticker? Front or back? In the words of the brain trust that is Mr. Homer J Simpson. Oh My God, Oh My God, Oh My God, Oh My God!!! I have just hit 10357 blog views. I started this little project on Dec 25, 2011. Over 10,000 views and 30 pounds later ( I really need to start walking again) I seem to be writing something a few people (all 5 of you that keep hitting refresh) want to peruse occasionally. SO, being that I actually made it a year and seem to still have something to write to you folks about (hey I have a 5year old kid and a wife, there is ALWAYS material) I have decided to close out 2012 with a bang. There are a few of you who have stated they like the stationery I send out. It comes in 2 flavors. 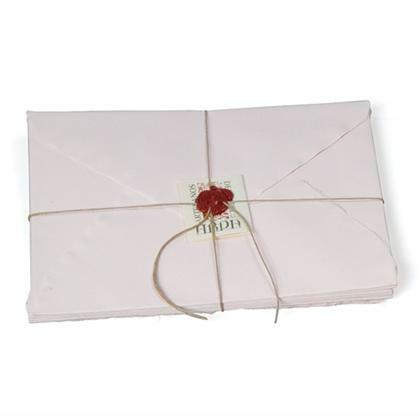 Pure Cotton or Laid Paper and 6 colors from Original Crown Mill. I am a fan. I have decided to bite the bullet and am trying a little side venture here and will be selling some different papers at GREAT prices. Not trying to get rich, just provide some neato paper to folks who like REALLY good paper without getting gouged in the process. So with that I am going to give away for Christmas (the day of launch on my blog) one of these. 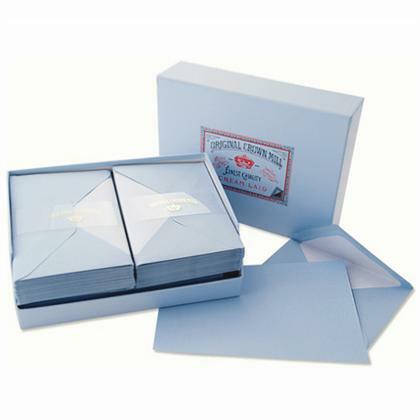 This is a "correspondence" set from Original Crown Mill - 100 Sheets of Laid paper (2 pads) and 50 envelopes in cream color. and This, 4.25" x 6.5" larger note size. This set would make an lovely invitation or announcement too. 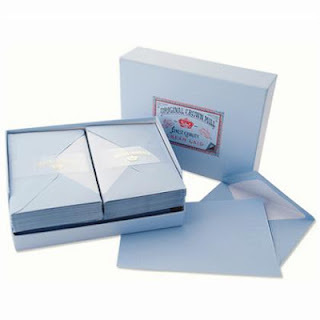 Subtle deckle on all edges of the flat cards and on the 4.75" x 7" envelopes. wrapped in string and sealed with wax. Handmade in Spain in pale blue color. So, interested? But where is the catch? There must be something? I need 3 dozen krispy kreme donuts on my doorstep by 6am or the milk jug gets it. No really, they closed the one by our house and now I need to drive forever to see that lovely flashing neon sign "HOT DONUTS". Ok not really, what I need is mail. You want to be entered you have to send me something. The site is called i Still Write, so write something. All entries MUST be received by Dec 24th (edit - I have extended this until Jan 1st, due to interest from new folks) . This "should" be more than enough time to put something in the mail. You MUST reference the giveaway "Derrick Dun Lost It" see, it's that whole reading thingy and you must be following the site. Did they just enter or did they actually read the instructions. So no mass mailing this time. I sunk the funds into good stuff. When sending out your correspondence, do you add that little bit of flair? I'm not taking Office Spaces Chotchkie’s (well Brian over there is wearing 37 pieces..). I'm talking about that little touch you put on your envelopes or letters that make it yours. For me it's stamps. Some of you have asked where I get mine. This one in particular. Am I a "stamper"? No, but I did stay at a Holiday Inn Express last night. When I first started letter writing, I thought I should get something to say this is me. Something other than sending out just plain envelopes. Now this doesn't work so well with made envelopes from maps and such, but for the nice laid or cotton paper stuff I use they are really nice. This weekend while taking a card making class, I discovered embossing powder (see the leaves on the picture above). So I went and bought a heat gun and some various powders in assorted shades. Makes for a really nice effect and unique textures. Really works nice when coloring as there is no ink to smear (you can't help but color in the lines). Where this comes in handy is when working with brush pens, you wont run your color over your stamp and trash you nice brush colors. Some of you have received by Pot Brownie stickers (don't judge me), or station logos, or homer variants. I try to limit these to hold them things closed uses. Mainly because I don't have a large selection of them. Now, for those of you who like the snail mail stamp. I will be giving away 2 of them for the holiday season. The stamps ( I just placed a LARGE order from them) are from Cat's Life Press. So how do YOU dress em up.